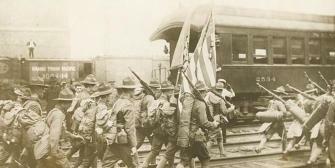 Join us as we commemorate the 100th anniversary of the United States entering World War One in 1917. The story of war is much more than the recital of facts, battles, strategies, dates, casualties, and treaties. No matter the impacts of war upon nations and the world order, the underlying story of a war is its immediate and long-lasting impacts on individuals. The impacts are upon the planners and initiators of a war, the combatants in the war, the families of participants, and those who must suffer the privations always attendant to war and its aftermath. The participants in the World War I Commemoration Reading Series will be offered opportunities to read and discuss novels and memoirs that explore triumph, patriotism, loss, separation, death, and remembrance. The book for November is Private Peaceful by Michael Marpurgo. Check back here for library listings, dates and times.